Helping your business succeed is the business of the Greater Reading Chamber of Commerce & Industry. Randolph Peers has spent the last twenty-five years working in the fields of economic & workforce development, adult education and association management, and currently serves as President & CEO of the Greater Reading Chamber Alliance (GRCA). 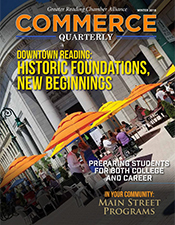 GRCA was formed out of a strategic alignment between three Berks County business organizations - Greater Reading Chamber of Commerce & Industry, Greater Reading Economic Partnership & the Greater Berks Development Fund. 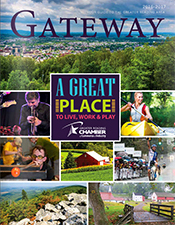 The GRCA, with an operating budget of over to $3MM and assets totaling over $40MM, is the leading business membership association and economic development corporation in Berks County, PA. Prior to this role, Randolph led Opportunities for a Better Tomorrow (OBT), NYC’s leading provider of job training and education services for disconnected youth. OBT is known for its highly effective job training and education program designed specifically to meet the unique needs of out-of-school, out-of-work, youth. OBT served approximately 5,000 people annually on an $8MM budget. Before becoming CEO at OBT, Randolph spent four years at the Brooklyn Chamber of Commerce as Vice President for Economic Development. During his tenure at the Chamber, Randolph managed a project portfolio of over $3MM, including Brooklyn Goes Global (exporting initiative) and the Good Help program (small business staffing service). Under his leadership, the Brooklyn Chamber launched a research department that produced the Brooklyn Labor Market Review and the Brooklyn Business Survey, two leading borough-wide business publications. One of his proudest achievements was developing a nationally recognized model for integrating workforce and economic development services for small business that has been expanded and replicated over the years. Randolph holds a Bachelor’s degree in Political Science from Brooklyn College and a Master’s in Public Administration from New York University's Wagner School. Karen loves coming to work every day. With sixteen plus years in this industry, Karen still finds the opportunity to work with companies both large and small as a huge reward. Beginning her Chamber career as the second Marketing Director hired for the position, Karen likes to think of herself as an entrepreneur, creating within the context of the organization the “next new program or initiative” that will resonate with members of the business community. Few folks know that Karen was an aspiring ballet dancer who had visions of going to Julliard and becoming famous…or at least dancing for a lifetime. Those dreams were not to be realized, and instead Karen headed from New England to Stephens College in Columbia MO and earned a BA in Fashion Merchandising. Karen and her husband Alan were small business owners shortly after graduating from College. For seven years they worked at their two businesses in Massachusetts and from that amazing experience learned a bit about signing the front of the paycheck. A perfect segue way to a career in Chamber world! As Director of Workforce & Education, Elle has the leadership role in coordinating involvement in workforce and educational initiatives designed to support the Greater Reading business community and promote an effective talent-development strategy for Berks County. She is responsible for developing and implementing related signature events and also validating employers' workforce hiring and training need requirements, including types of positions and careers, education and certification requirements and workplace skills and readiness to align the workforce pipeline to the public and private resources available. Prior to her promotion, Elle served as the Chamber's Communications Coordinator for several years. Prior to joining the Chamber team, Ellen was the Program Manager at Junior Achievement, where she coordinated community and business volunteers with local school districts to provide financial literacy and work readiness skills to students in grades K-12. She currently serves as an active Board Member for Exeter Community Education Foundation and Reading Beautification, Inc. In addition, she serves as a member of the Occupation Advisory Council for Lehigh Carbon Technical Institute and volunteers as a regional judge for annual DECA competitions. Ellen is passionate about education, and has also volunteered in the classroom as a CHOICES facilitator and conducts mock interviews in local high schools. She has a B.A. in Communication Studies from West Chester University. As our Small Business & Latino Outreach Coordinator, Jobany provides resources and solutions for small businesses in the Berks County community; establishes new relationships for the Chamber and engages with current members and provides resources and support for Latino and minority-owned businesses. Jobany comes to us from the United Way of Berks County where he was Campaign and Community Relations Manager. He currently serves on the Executive board of The Council on Chemical Abuse, is a bilingual mentor for SCORE of Berks County and Board Chair for Star City Boxing. In Lancaster County, Mr. Bedoya was active in the Spanish American Civic Association (SACA) - one of the largest Latino nonprofit organizations in Pennsylvania, the Latino Vision Association (LVA), the Latin American Cultural Center (LACC) and founder of Union Colombiana in 2013. Jobany is also an entrepreneur and owns a DJ & event planning services business which will serve him well in his new role with his small business ownership knowledge and experience. Jobany earned an Associate Degree in Business Studies at Harrisburg Area Community College. As the Chamber’s Director of Business Services, Mark is responsible for outreach to Berks businesses to evaluate needs for employee development and organizational growth. This is a perfect career match, since his true passions in life include developing others, being intellectually curious and acting as a life-long learner. In his leisure time, Mark enjoys playing music and spending time with his wife and Golden Retriever, Max. You can often find Max alongside of Mark riding around in the car for joy rides. He is committed to serving in the community and actively volunteers in the Exeter Community and for the Berks Jazz Fest. Mark also enjoys cooking for family and friends, and sampling cuisine from around the world, especially Middle Eastern and Thai cuisine. Missy is an integral part of our membership team. As member specialist, she streamlines the application process and new member orientation. She on-boards new members and helps them with any questions about Chamber products and services. Member engagement is also an important aspect for Missy – she makes sure our members are taking advantage of all the Chamber has to offer. Missy assists our Director of Membership and works closely with our Chamber Ambassadors. Prior to joining the Chamber team, Missy worked extensively in the customer service field. In addition to Missy's many talents, she is also a skilled pastry chef. While not working closely with Chamber members, Missy enjoys spending time with her husband, Blaine, and her son, Daniel, who keeps them busy with football, basketball and baseball. She also enjoys reading books authored by Janet Evanovich as well as other murder mysteries. She is an avid hiker and loves game nights with her family. Sarah Hunter-Lascoskie is a professional communicator with a passion for storytelling and her hometown. Prior to joining the Chamber, Sarah was Associate Director of Marketing & Development at Berks Encore. A Berks County native, Sarah spent six years in Philadelphia creating comprehensive, accessible exhibits and digital campaigns in museums. She returned to Berks in 2014 to focus on producing cohesive branding, language, and excitement for local nonprofits. Her nationally-recognized marketing strategies center on creating an authentic voice that produces and effects change. She is a graduate of the University of Pennsylvania, Temple University, and Leadership Berks. She has served on the Giving Tuesday Berks Steering Committee and currently serves on the Leadership Berks Alumni Council. Sarah lives in South Heidelberg Township with her husband, daughter, and two cats. She is an avid reader, especially of science fiction, and appreciates live music, green space, and tea. Bethany, our Director of Events, is a consummate perfectionist and is passionate about her profession. She comes to the Chamber from Music Festivals & Tours and has 20 years of experience in planning events of varying sizes, including serving as Event Chair of the Macy’s Great American Marching Band culminating in the Thanksgiving Day Parade in NYC with 250 teens. When not managing events, Bethany enjoys reading thrillers - especially while lounging on a boat whale watching. She can often be found in the stands cheering on her son at one of his many sporting events. As Senior Vice President – Government and Community Relations, Gail is accountable for leading our policy agenda, strategic communications and advocacy initiatives to strengthen the economic/business climate and quality of place for our region. Gail is originally from western Pennsylvania, where she stills spends winter weekends as a certified ski instructor. She is a recognized leader in regional and statewide initiatives associated with economic development and education, industry alliances, community and professional associations as well as a variety of charitable endeavors including Katrina/Iowa Flood Mission Trips and Prayers & Squares Ministry. Gail is a graduate of the University of Pittsburgh, EEI Executive Policy Institute, Principles of Public Utilities Operations and Management, Penn State Executive Institute. She is a lifetime Certified Purchasing Manager, Novation’s Mentor and Sean Delaney Facilitator. Gail enjoys spending time with her family and friends along with skiing, golfing, fishing and gardening. Anna is the “voice of the Chamber”. With her vast knowledge of all things Chamber, she will enthusiastically and efficiently answer any questions or pleasantly direct you to another staff member. She is our Certificate of Origin aficionado and resident notary. The backbone of our accounting system, Anna can process a check, credit card or even – incredibly enough, cash in the blink of an eye. She can keep an astonishing number of plates in the air with nary a chip – and we never hear the sound of shattering tableware! Anna is a born and bred Readingite who is proud of coming up through the Reading School System. Anna spent quite a few years in the printing industry, working with an orthopedic company, and publishers of school books from all over the United States and England. Anna is active in Berks County activities and when not coaching her daughter’s cheer squad, can usually be found at a Fightin Phils game or a local fair with her husband, Joe and their two beautiful children Taylor and Derek. Anna, although well-travelled, is delighted to have settled at the Chamber in the heart of Reading. Please call anytime, if only to hear her friendly and lilting voice. Teresa ("T") oversees operations and technology at the Chamber – managing IT and the database, serving as webmaster and graphic designer, overseeing various projects, and just about anything else that manifests itself. The youngest of seven children, she was born and raised in the suburbs of Reading, where she still resides. After graduating from Holy Name, she received a Degree in Business from Penn State. Teresa's background is in manufacturing, including many years in specialty metal sales and office management. She is a trained internal auditor with a penchant for developing and documenting processes and procedures. A true devotee of Stephen Covey's The Seven Habits of Highly Effective People, she admits that her paradigm is still in the process of shifting. Teresa has a knack - and a passion - for anything "computer,” and this, along with her love of fantasy epics, historical novels and technical how-to books is why this "Trekkie's" office is marked "geek inside". When not sitting in front of a computer, she can be found at the side of her exceedingly romantic husband, Bill - usually at the local book store. Teresa is a very proud mother of four "perfect, yet very entertaining" children and "Nana T" to two truly extraordinary angels with tilted halos. Although a cat-woman, the bane of her existence - and the love of her life has been her Siberian husky, Diggs. "T" is thrilled that her path has led her to the Chamber and is always more than happy to help our members in any way she can. Missy is an intragal part of our membership team. As member specialist, she streamlines the application process and new member orientation. She on-boards new members and helps them with any questions about Chamber products and services. Member engagement is also an important aspect for Missy – she makes sure our members are taking advantage of all the Chamber has to offer. Missy assists our Director of Membership and works closely with our Chamber Ambassadors. Prior to joining the Chamber team, Missy worked extensively in the customer service field. In addition to Missy's many talents, she is also a skilled pastry chef. While not working closely with Chamber members, Missy enjoys spending time with her husband, Blaine, and her son, Daniel, who keeps them busy with football, basketball and baseball. She also enjoys reading books authored by Janet Evanovich as well as other murder mysteries. She is an avid hiker and loves game nights with her family. Justin oversees the Chamber Membership department. He has a vast background in sales and customer service, spending years in sales management for a medical equipment company and in recruitment for a staffing agency. He is the former Membership Chair for Greater Reading Young Professionals (GRYP) and hosts a weekly podcast called the Growth Now Movement. Constantly striving for growth in all aspects of his life, Justin has a positive approach to his profession and displays a passion for the work that he does!